The Battle of the Bulge was a surprise German offensive that took place between Trier and Monschau in late 1944 to early 1945. The battle was a surprise offensive by the Germans and is also known as the Von Rundstedt Offensive or the Ardennes Offensive. It took place in the thick, wooded area of the Ardennes Forest region stretching from southern Belgium, Luxembourg, and into Germany. 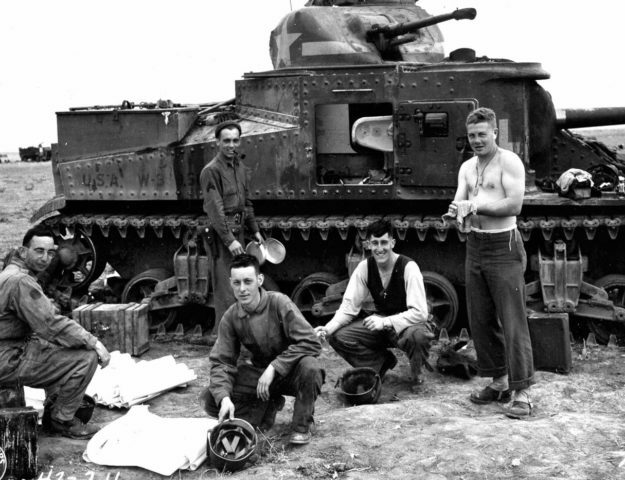 Although intended to split the Allied forces into two to help negotiate a peace on the Western Front, it resulted in vital losses of personnel and equipment for the Germans that would ultimately result in the culmination of World War 2 later in 1945. 1 When Did the Battle of the Bulge Occur? 2 Why Did the Germans Initiate the Battle? 3 How Did the Germans Surprise the Allies at the Battle of the Bulge? 4 How Did the Battle of the Bulge Start? 6 Who Were the Commanders During the Battle of the Bulge? 12 Battle of the Bulge Map "Erasing the Bulge"
When Did the Battle of the Bulge Occur? Why Did the Germans Initiate the Battle? By the end of 1944, the Germans were hurting with supporting the war on two fronts. 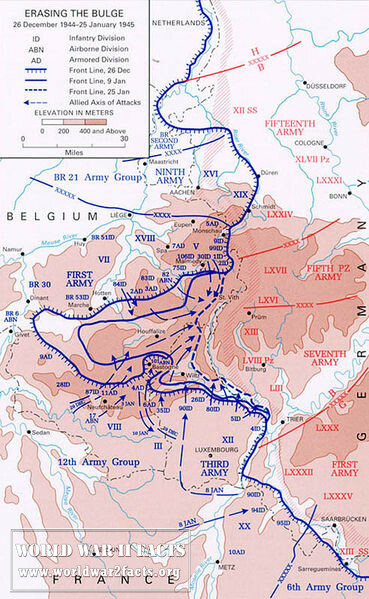 The goal for the Battle of the Bulge was to split the American and British line in half, capture Antwerp, Belgium, and then proceed to encircle the four Allied Armies. The ultimate goal of Hitler was to force the Allies in the west to negotiate a peace in the Axis Powers’ favor. Hitler could then turn and fully focus on the Eastern Front. How Did the Germans Surprise the Allies at the Battle of the Bulge? The Nazis took great care to plan the attack in secret with minimizing radio traffic and only moving soldiers and gear at night. Although the Allies were reading the Ultra traffic by this time and the Third Army (U.S.) G2 (Intel) staff was predicting a major Nazi offensive, the Battle of the Bulge still caught the Allied Powers by surprise. More than 65 years after the battle, the causes of the surprise are now attributed to a lack of quality aerial recon, Allied over-confidence, and a pre-occupation with offensive plans. How Did the Battle of the Bulge Start? The Germans achieved almost complete surprise against a weakly defended sector of the Allied front lines during a time of heavy overcast weather. This had grounded the friendly air forces which compounded the impact of the surprise German attack. Although surprised, the Allies put up stiff resistance around Bastogne, and had the advantage of superior terrain. This resulted in pushing the German time-table to the right. As a result, the Allies were able to reinforce the line using General George Patton’s Third Army and other units which combined with improvements in the weather, resulted in the German offensive failing. 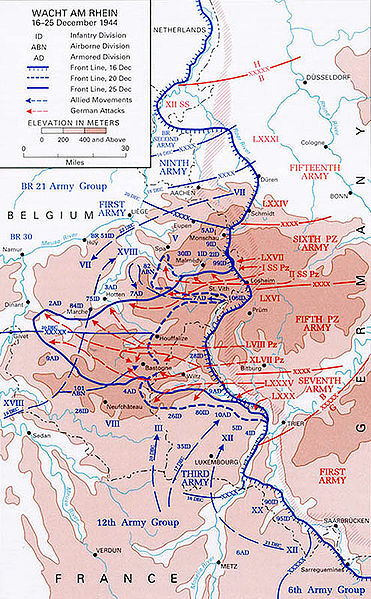 Official U.S. Army illustration: The "Front lines" map (indicated by the solid and dashed blue lines) showing the swelling of the Bulge as the German offensive progressed east to west creating the nose-like bulge shape (salient) during 16–26 December 1944.
Who Were the Commanders During the Battle of the Bulge? 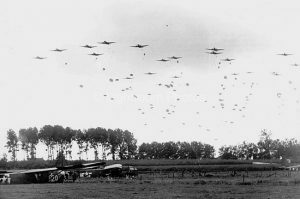 The U.S. 82nd Airborne Div. dropping on Grave, during Operation Market Garden. Since the battle took more than a month, the full list of Allied and Axis units will be posted at a later date on this website (ie would make this article too long). After the initial surprise of the Allied lines on the Western Front, the Germans were able to achieve breakthroughs in up to six locations. For the first two weeks of the battle, it didn’t look as though they were going to be stopped and that they would achieve a penetration of more than 70 miles into the lines. This would result in a significant “Bulge” that the 58th Panzer Corps and 47 Corps would pour through created by the collapse of the 106th and 28th Infantry Divisions. The 106th was newly arrived and had not yet been tested before the battle. After conferring with General Omar Bradley at headquarters in Paris, the Supreme Allied Commander, General Dwight D. Eisenhower, decided to order Gen George S. Patton on the south of the Bulge (or salient) and General Hodges on the north to pivot the Third and First Armies respectfully and to focus on cutting off the Bulge at its base. Additionally, he deployed the 82nd and 101st Airborne Divisions by truck and committed all U.S. reserves in Europe to the fight. German troops fighting in the Ardennes. The soldier in the foreground is equipped with the Heer's new StG-44, the world's first assault rifle. December 26th. Inspired by reports the Germans had executed a number of American POWs at Malmédy, the 82nd Airborne Division would go on to stop the Germans at Houffalize and provide stiff resistance at St. Vith. On Christmas Eve, the U.S. 2nd Armored Division led by General James Collins would stop the German Panzers three miles from the Meuse. 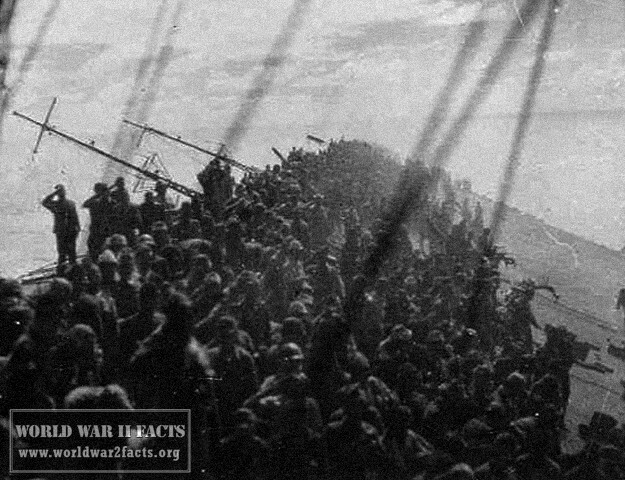 At this same time, the weather cleared permitting the Allies to start attacking the German supply lines and forces and would consist of more than 2,000 planes. The Luftwaffe would inflict significant damage with the U.S. and British losing more than 150 planes, but the German losses in the air would prove catastrophic to continuing the fight losing approximately 300 during the battle. The U.S. Third and First Armies would commence the directed pincer movements on January 3rd, but would not close on Houffalize until January 16th resulting in many of the Germans escaping. The German counteroffensive had then been defeated; however, was the bloodiest battle of the war for the U.S. The German casualties have never been accurately assessed, but it is estimated that they lost approximately 200,000 to include approximately 110,000 as POWs to include 1,400 tanks and more than 600 types of other vehicles. Adolf Hitler’s decision to conduct the counteroffensive instead of the smarter, military move of a delaying action with defense focus resulted in the Germans losing the last of their vital reserves. There were no longer veteran troops and the depth of panzers (tanks), artillery, and other vehicles that the Nazis had enjoyed throughout the war. The failed invasion would ultimately signal the start of the invasion of Germany from the Western Front. Battle of the Bulge Map "Erasing the Bulge"
December 11th, 1944 – Adolf Hitler held a planning meeting with his top military commanders at the Adlerhorst HQ located in Wetterau, Germany. During the meeting, he stressed the importance to the Third Reich of the upcoming Ardennes Offensive. 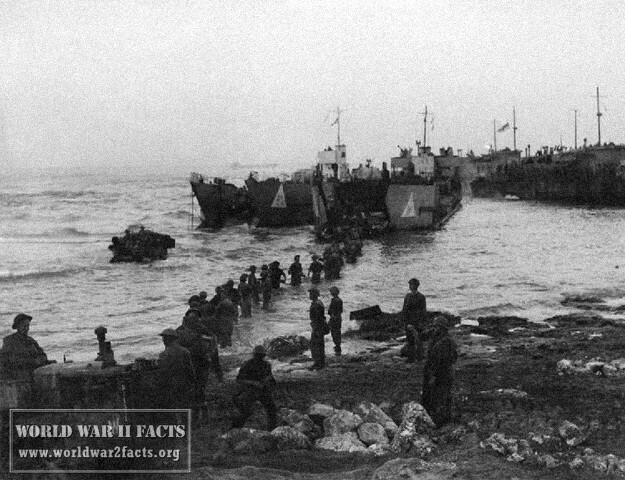 December 16th, 1944 – German forces crossed the Rhein River starting Operation Wacht. This would signify the opening of the Battle of the Bulge. December 17th, 1944 – The German Waffen-SS forces killed 150 United States POW’s of the 285th Field Artillery Observation Battalion at Malmédy, Belgium. Only 43 of the POW’s gathered in the field at the site of the massacre survived. December 18th, 1944 – The German offensive began to stall in the Ardennes Forest in Belgium. 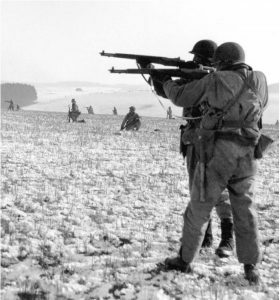 December 19th, 1944 – German forces surrounded more than 9,000 United States soldiers in the Schnee Eifel region on the Belgian-German border region. On the same day, portions of the reserves of the 101st Airborne Division (U.S.) and the 10th Armored Division of the United States Third Army were sent to Bastogne to hold a critical road junction located in Belgium. Members of the 117th Infantry Regiment, 30th Infantry Division, move past a destroyed American M5 "Stuart" tank on their march to capture the town of St. Vith at the close of the Battle of the Bulge. St. Vith was largely destroyed during the ground battle and subsequent air attack. American forces retook the town on 23 January 1945. United States located in the town for their own usage. December 21st, 1944 – United States forces were able to re-take Stavelot, Belgium. On the same day, the Germans were able to take St. Vith and Bastogne. 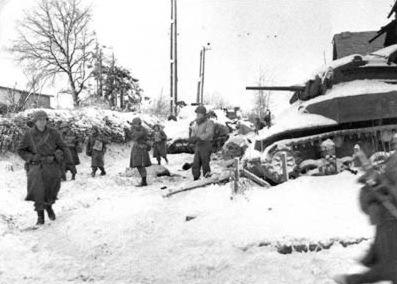 December 22nd, 1944 – Despite being surrounded, American General McAuliffe responded to the demand of surrender by the German forces with the now famous response of “Nuts!” The U.S. Third Army continued to shift the axis of advance in order to relieve the Allied forces located at Bastogne. December 26th, 1944 – General George Patton led the United States Third Army to the relief of the besieged forces in Bastogne, Belgium. December 27th, 1944 – American forces started to push the German forces back in the Ardennes region officially ending the German offensive. December 28th, 1944 – Despite the fact that American forces were starting to gain ground in their counter-offensive, Hitler ordered new Axis offensives in both the Ardennes and Alsace regions (against the advice of his advisors and Generals). December 31st, 1944 – American forces were able to re-capture Rochefort, Belgium. On the same day, the United States Third Army initiated an offensive from Bastogne. 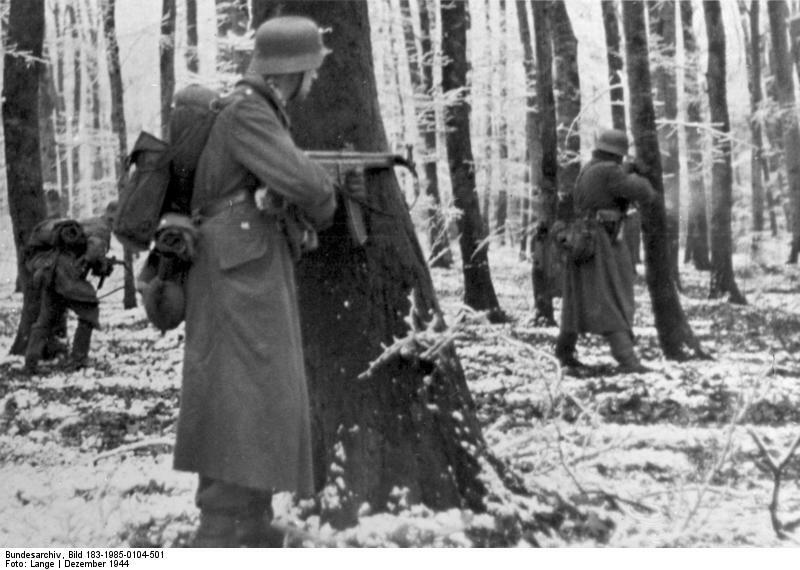 January 1st, 1945 – German forces started to withdraw from the Ardennes Forest. Unternehmen Bodenplatte was launched by the German Luftwaffe which consisted of strikes by 800 aircraft against the Allied airfields located in both Belgium and the Netherlands. Although 220 Allied aircraft were destroyed, the Germans lost 188 aircraft in addition to a number of experienced pilots and failed to achieve their objective of taking out Allied air power in the area. January 3rd, 1945 – The United States First Army commenced an attack on the northern-most flank of the Ardennes bulge. On the same date, more than 1,100 Allied bombers took out communication and rail centers in Germany. January 5th, 1945 – German forces called off their attack on Bastogne. January 9th, 1945 – The United States Third Army started to attack the southern flank of the Ardennes Bulge near Houffalize, Belgium. January 12th, 1945 – The German offensive into France was stopped 13 miles short of Strasbourg. British and American forces were able to link up near La Roche-en-Ardenne north of Bastogne. 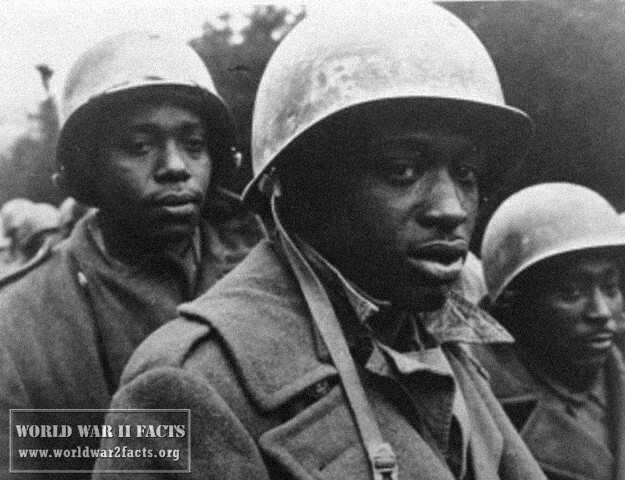 January 16th, 1945 – The United States Third and First Armies were able to link up near Houffalize, Belgium. German forces were forced back to the battle lines that existed prior to the start of the Battle of the Bulge. January 28th, 1945 – The “Ardennes Bulge” was pushed to the original battle line that existed prior to the German offensive. This would signify the ending of the Battle of the Bulge. Battle of the Bulge – Official webpage of the United States Army. Accessed: December 12th, 2013. "NUTS!" Revisited: An Interview with Lt. General Harry W. O. Kinnard . 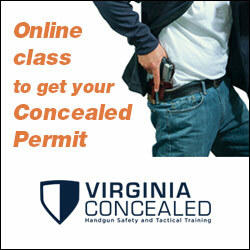 Accessed: March 11th, 2013.